The 2-2 point invasion is a trick play made against an isolated 4-4 stone. It is intended to give the invader either an equal result (when the defender takes the side) or a good result (when the defender tries to kill the invasion). However, there is an easy counter to the trick play, and the invader ends up with a horrible result if the defender is not tricked. 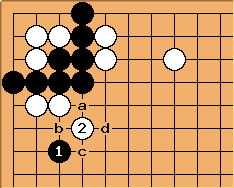 White then plays two peeps as kikashi to force black to connect, and then extends towards the side. 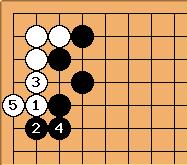 Now black has a heavy group that only has one eye in the corner. 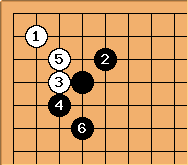 Anonymous: Question, what if black plays 5-5 would that not allow him to escape to the center? MrTenuki (KGS 3k): Sure, playing at the 5-5 point is an option. 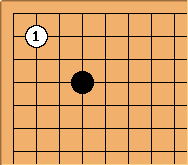 The point is that black HAS to escape to the center now if he wants to keep the group alive, as the heavy group (as said above) only has one eye in the corner and cannot expect to get a second eye from the sides. Of course, Black can try a counter-attack with . Still, Black is going to be at a disadvantage in the upcoming fight. 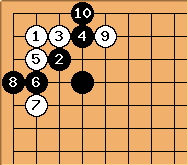 After the kosumi, black cannot threaten to cut at a or b without weakening either of the two groups. And if black attaches at c, white can simply walk ahead of black by extending to d. Black can aim to press down the upper white group, of course, but this result is obviously disastrous for him. Here's another possibility for black. Now white actually has to worry about the life of the group on the left side. 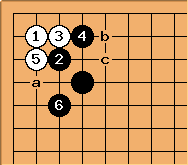 Still, after , a and b are miai; white either lives on the side or breaks out. Without support, there's no way for black to get a good result here. So black could also play this way. 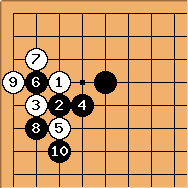 In this case, black ends with gote and the result is roughly equal. 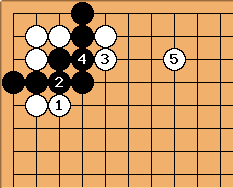 But this is still not the best play for black, because white's trick play can be punished. 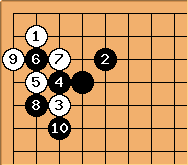 Assuming that there are no other stones nearby, this is one way that black can punish the trick play. Here, the key move here is . 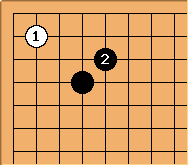 Unlike Case 1, where is played at a, black has better shape. Also notice that a white clamp at "b" next would be meaningless, because a white peep at "c" next is still not enough to destroy black's eyeshape. 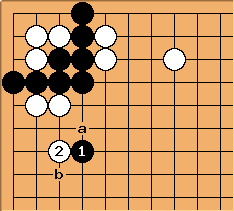 Bill: After above, Black can extend at least as far as and still keep the corner dead in good shape. The best thing that White can do when with best play by black is perhaps to live in the corner. Unfortunately, this can only be achieved in gote, and White is shut in. This is the reason why the 2-2 point invasion is only a trick play at best unless the surrounding situation makes it reasonable. 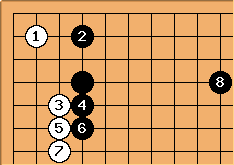 Bill: If White played this against me in a handicap game, my first impulse would be to tenuki. White has already made an inefficient play, thank you very much. Bill: Except one line over. 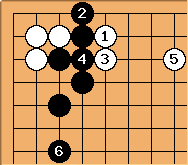 White not only gets a smaller corner in the previous diagram, Black's influence is greater on the top side. Bill: Here is another variation. White is shut in and looks pretty sick.